Have you ever passed your palm over a pan of boiling water? What did the steam do to you? Many times it leaves an irritating burning sensation. You cannot help but check from time to time if your skin is bruised or not. Being at the hot springs feels almost like that. It is so hot that foods like eggs and Irish potatoes can boil in under 15 minutes and meat would be ready in about half an hour. It feels like you are being bathed with hot steam. It is no wonder that the guides advise that you wear light clothes when going there. One of the people we were with did not heed to this advice. But even before we had completely toured the first hot spring, he had taken off his shirt. He stayed in his vest only because he could not walk around bare chested. Each of the hot springs is surrounded by forestry and is veiled in a cloud of steam, one has an interesting reed walkway. Semiliki National Park, the home of the hot springs is about 330km away from Kampala, an equivalent of a six hours’ drive. The now wider road from Fort portal town has tens of corners so you just cannot rush the trip. One of the wider bends offers good photo moments. The vast green vegetation along the road makes for good scenery. It is wild and beautiful. The guided tour that leads to the hot springs is filled with noises of birds singing and if you are lucky, you will spot a monkey or two. The hot springs are boiling springs with bubbles that sprout out to a height of about 2meters. It is amazing and yet the guide says in the 1990s they used to sprout higher but have now reduced probably because of climate change. That they are called female and male is very interesting. It makes you draw all sorts of visuals in your mind. Forgive the stereotypes, but I could not help wondering if the male hot springs sprouted out violently and looked rugged, something resembling a macho man. I wondered if the female hot springs were like a lady; gentle and graceful. But no, in fact if they were to be personified, you would think they switched sexes. Their names make sense when the guide explains that a tribe from the area, the Bamaga named the springs. They believe that they represent their ancestors; a male and female that mysterious disappeared at each of these spots. To date, from time to time, people belonging of the tribe go the spots and perform various rituals to appease the ancestors so that they bless them. We walked to the hot springs but there is an option of a boat ride that the bird watchers might prefer. But just before starting the tour, carry some eggs or Irish potatoes to boil just so you prove how hot the water is. Another amazing thing is that the water is salty as well, you do not need salt for the foods boiled in it. There is a scientific explanation for that. You should also carry a lot of water and you are better off wearing closed shoes or hire gumboots at the park. You can plan your trip in a way that you make stops at the equator, Lake Mburo National park, Kyambura forest reserve and Queen Elizabeth National Park before proceeding to Bundibugyo district where Semiliki is located. On your way back, check out the beautiful places Fort portal has to offer. But if you are not used to travelling for long distances, it is advisable to spend a night in a nearby town like Fort portal and then heading there the following day. If you intend to camp in Semiliki, you are better off going with everything you think you will need, buying supplies from the nearby places is tricky because you will not get all you need. Whatever you choose, a tour hot springs will most probably leave you with sweat dripping down your back and droplets on your forehead. I started with mental preparation - that's telling myself I needed to lose weight. It's what we all begin with, right? I even included it in my 2013 resolutions :-). But week after another all I did was tell myself I need to lose weight but did nothing about it. Walking: In May, I tried to walk a lot more than I usually did. This was frequent but it didn't work because it was done at a leisurely pace. For one to lose weight the heart rate needs to increase, if it doesn't, then you are doing nothing. Missing meals: At first, it was easier for me to starve myself than do exercise. So I missed as many meals as I could. I shrunk and thought I had actually lost weight only to gain it all back when I started eating regularly a month later. It turned out that I was only dehydrated :-(. Jogging without a timer: Jogging is good and helps one lose weight. But for that to happen, you need to jog in a way that you burn more calories than you consume. That is by jogging for a longer distance which is hard to do if you are not a measurements freak and have no timer. Once, I went out of the house and jogged at a very fast pace. I felt like a ninja. It tired me fast and I found the fastest way home. My heart continued to pump fast minutes after getting home. I felt so proud that I had gotten my heart to pump that fast only to check the clock and found that I had run for only 10 minutes yet from the way it tired me, it felt like 30. Others: I also tried zumba and bought an aerobics DVD but none worked for me. The hot cup of water sometimes with lemon taken every morning didn't help either. I also tried doing aerobics in a gym but failed - I found it hard to be there every day at 7pm. Jogging with a timer It's then that a friend told me to download Runkeeper. It is an Android app that allows users to track fitness activities (such as walking, running and cycling) using Gps. All you have to do is activate your Gps, turn it on and it will measure your pace, distance covered and calories burnt. It was perfect. I decided to start jogging on Monday. I like starting resolutions on Monday. It makes me feel like I have a lot of purpose as I start the new week. It sets the pace and I find it easier to stick to my targets if started on Monday. Using Runkeeper means you have to run with your device (phone). Because my kukyala phone is huge I bought a waist bag before I could hit the road. I chose a route with two elevated areas. It's good to have a hilly area in your route because you need a lot more strength to take it. That means you work harder and burn more calories. Normally, I am on the road at the ungodly hour of 5:45am for 20 to 25 minutes so that I am able to make it to work on time. It's so early and yet just like the person who will read this after you, I love my sleep and don’t function well if I get less than 8 hours of sleep. For me to be able to wake up at that time with minimal struggle I have to go to bed very early. Since it's so early the biggest part of my route is on a main road where there's activity at that time, making it safe. I started jogging on July 8. It was so hard. That day, shortly after I had started, my throat was hot and it felt like my heart was literally going to burst. After one hill every bone in my body was begging me to stop, but I kept on going. I really pushed myself. When I got too tired, I rested for a minute or two and then continued till I couldn't go any further. On getting back home. I found that I had done 1.5km. I was proud of myself until I saw people's posts and tweets of 5km,10km and even 21km covered. I decided to make a timetable for myself. Week one: I covered 1.5km and rested after every 0.5km. I run six days a week. On the sixth day, I run longer. The distance covered then determined the distance to cover the following week. On the sixth day of week one I covered 2.1km and didn't rest at all. I never rested again during my run. That week, I got muscle pains that stayed for about 10 days. Week two: I covered 2.1km for five days and 2.5km on the sixth day. To keep this up I kept on doing lots of reading especially about how to regulate breathing. I learnt it was best and easier to breathe normally and not to open your mouth while running. Week three: I did 2.5km for five days and 3km on the sixth day. If I didn't run on a day I was supposed to, I skipped the rope 500 times (but this rarely happened). Week four: I still did 2.5km for five days because jogging for 3km meant I get to the road earlier which is dangerous. On the sixth day I run for 3.5km. Then set in the ankle pain. My ankles hurt so bad and once made me tear. I found someone to report to about my daily activity and asked them to nag me if I didn’t give feedback. It's the only way I stayed on the road despite the unbearable pain. Later he advised me to change my shoes and get proper running shoes. 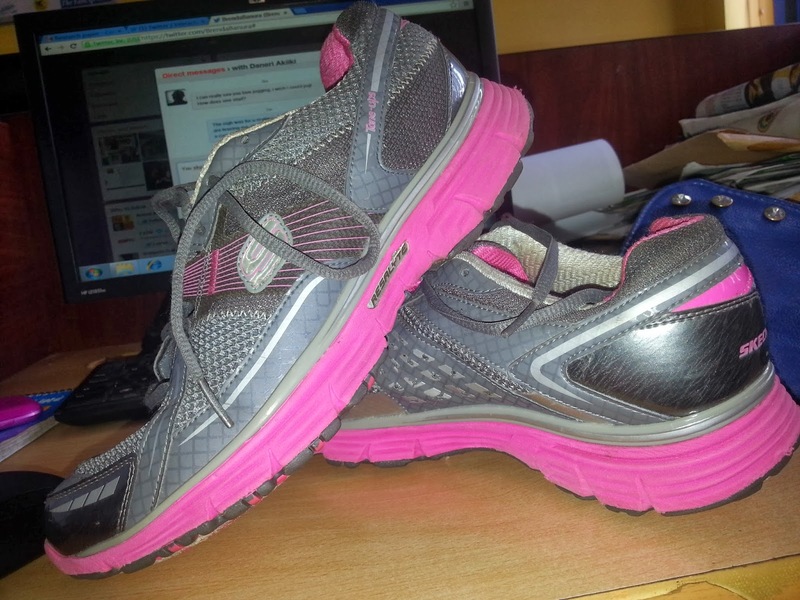 I got a pink and grey pair and my ankles stopped hurting shortly after jogging in them. One month down the road and I was already getting "you have lost weight" comments to my joy. But I needed to burn a couple more calories so I kept on. In the second and third month I reduced the days to four to five days of running 2.5km each day. As I jog, no matter how tired I am, I never rest, instead I slow down and increase my pace when I have rested. In the fourth month I reduced it to three times a week and increased the distance to 3km. I also learnt that sweating doesn't mean you are being productive. In fact some people don't sweat at all despite how hard they work out. To tell if you are working out, monitor your heart beat -if it's faster than normal then you are being productive. In the fifth, I got a running mate who was a beginner. I couldn't make him jog for 3km right away so instead we covered 1.5km six days a week. When he rested I jogged from one position. One weekend I did 5km and another 6km, that is the day I bought a new pair of running shoes, it must have been out of excitement -- that's the longest I have jogged without resting or walking. On the same day I started running, I decided to have less meaty meals. I ate and stopped at that point when my tummy was starting to stretch. If there was nothing vegetarian on the menu I ate only meat soup. I always bought an apple at the end of the day to carry and eat when hungry the next day. Sunday was my meat day. Whenever I gave in to the craving for pizza, ice cream and the like - I ran for 200 to 500 meters more as a punishment – it was easier to just keep off them. To treat myself, I go to an exotic place for fruits platter or for a pedicure or manicure at a place I wouldn't ordinarily go to as opposed to going for ice cream. It's good to have a partner but that doesn't mean you can't do it on your own. If you must, you can have one who you only report to. A calendar or chart can also work. When you attain your goal, do not stop working out, you can reduce the frequency but don't stop completely. I am the kind that easily gains weight so I don't plan on ever stopping completely. And I still have a couple of problem areas whose calories must be burnt. The hardest part about this is waking up. But once you are out of bed, the rest is easy. After running, I always feel like I can conquer the world. That feeling makes all the sweat worthwhile. The RunKeeper slogan is that half a mile is better than no miles at all. 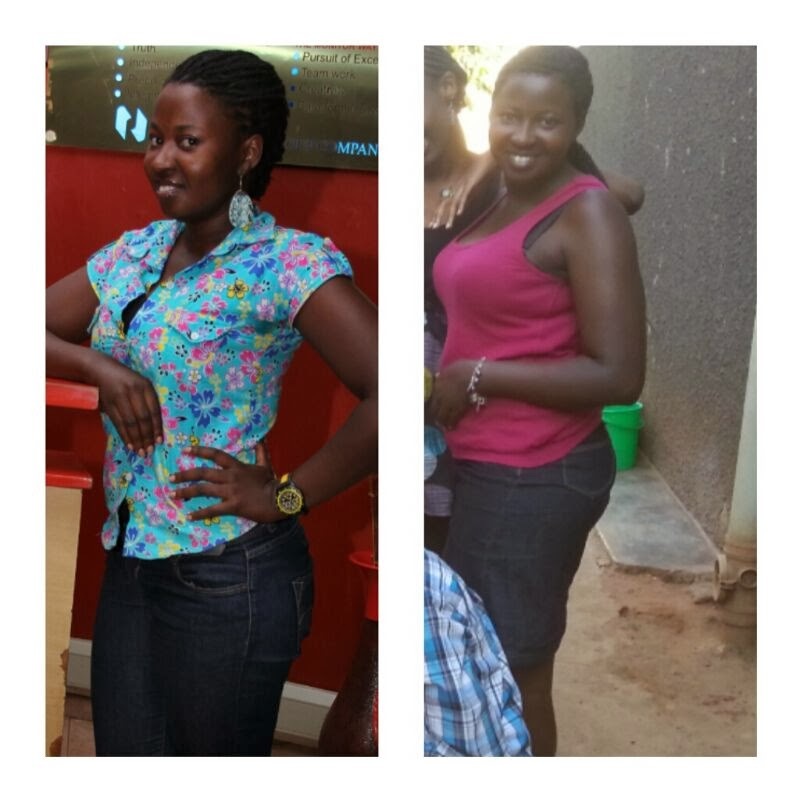 It's because of trying to do this every other day that I found myself at 60kgs from a round 70kgs! The fact that it won't happen till over 100 years later makes the eclipse a timeless topic. You can write about it whenever. I made it to Pakwach to view the eclipse. And the hybrid eclipse did not disappoint. It is the most beautiful thing I have ever seen. It happened on November 3, as was predicted. It was amazing to see that the biggest percentage of the crowd were Ugandans – Ugandans whose trips were not sponsored by companies but who individually spent money and travelled to see the once in a lifetime event. Like most awesome moments, the hybrid eclipse viewing was dramatic. Clearly, the media did a good job sensitising people on what eye gear was suitable. Everyone tried to get hold of the recommended eye gear – some wrongly used or based on myths. Before long make-shift glasses with film negative strips were on sale going for Shs2,000. When someone said the media had rendered them unsafe, people stopped selling them. But with the authentic eclipse glasses going for a whopping Shs35,000 many had to improvise. Polythene bags and x-rays found their way to the streets. But what was interesting was those who insisted on using sunglasses. Knowing they were not safe, they bought small lamps (commonly known as tadoba) and candles and coated their sunglasses with many layers of soot. It was a popular Plan B. It is evident why Owiny Primary School, Pakwach, was chosen as the official viewing place. There, the sun shines like those are its last moments on earth. As viewers bought bottle after another of water to quench their thirst, some people, men in particular decided to either undress or dip their outfits in water and wore them again. And in no time the clothes would be dry. Even though it was mostly scorching hot in Pakwach, at about 4.30pm, it became cloudy, and for a long time. 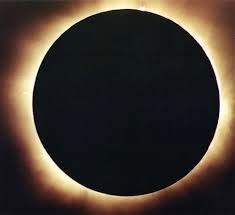 Viewers had already seen the start of but not the total eclipse that everyone had come to witness. Prior to the D-day, there had been jokes about the possibility of a no-eclipse show. One couldn’t help worry about the possibility of not seeing the total eclipse because of the clouds – the beautiful sky was no compensation. Viewers even started praying for the sun and moon to reappear. One tourist with his face lifted to the heavens, started blowing away the clouds furiously until they made way for the sun and moon. Shortly after, the sun and the moon met. It was dark for a couple of seconds - the sky black with outstanding sparkling orange rings. It was beautiful – the viewers cheerfully clapped and screamed as if to congratulate the sun and the moon for a great achievement. Many people love to take a break at the end of the year. But 12 months is a long time to wait, right? A group of friends and I therefore decided to make use of a mid-year public holiday that luckily for us fell on Monday making the weekend longer. Though in dire need to unwind our wallets were only semi-smiling. 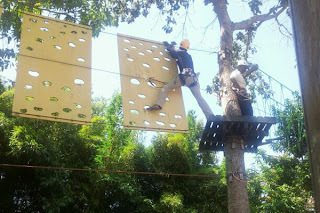 We agreed and made plans to spend two days and one night at Lake Side Adventure Park, Bule Island. Seeing as we were not spending too much on the trip, we didn’t expected it to be a lot of fun. The excitement was initially because we would be altogether and out of town. But we were wrong. The activities tired us to the bone. We totally enjoyed ourselves while there. Bule Island is located somewhere in Mukono, you can get there by water and road briefly or road alone. The complete road trip is longer and more costly. We opted to go by water. This required us to be at KK beach at an agreed time from where we were picked. If with spending the night at Bule Island, you can leave your car parked at KK Beach Ggaba over night. Prior to the trip, we were told it would cost us Shs5,000 per night but when we talked to the guards they said it is free of charge. We travelled on boat for less than 20 minutes and then into a car to Lake Side Adventure Park. Transport is about Shs20,000 to and from. It is less if you are many. And you don’t have to spend the night. If you decide to, that will cost Shs30,000 in the dormitory. The cottages are a little more expensive but where under construction when we went there. The vacation mood starts the moment you get onto the boat thanks to the vast fields of vegetation surrounding the place. It is serene, the air so fresh that you wish you could bag some of it. We were told that the network is poor for all telecom companies once you get on water. We complied at first but were later grateful for that. It helped us relax more because we paid attention to each other and our surroundings instead of being on phone half of the time. At the park are two main activities, the obstacle course which is Shs10,000 per person and the high rope which has two levels each costing Shs30,000. 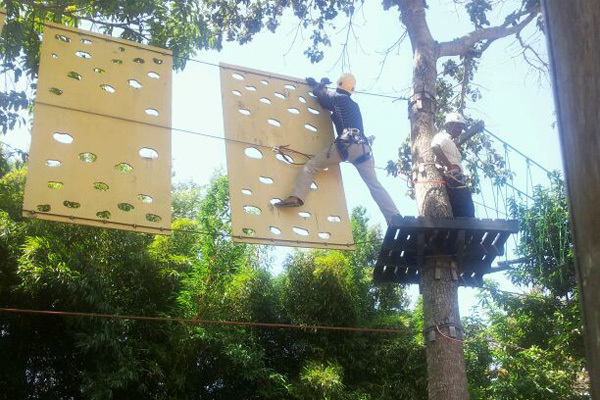 Involving running up and down, jumping and all kind of things, the obstacle course seemed so easy to do. We were divided into two groups and told to compete away and repeat as many times as we wanted. We thought we would compete one on one after the group competition. But when we finished, competing as groups once, with a few bruises, sweaty bodies, exhausted, we walked back to our rooms quietly. Word of advise, don’t go for this after a heavy meal. The high rope is also a mixture of challenges divided into two levels. The second is obviously more challenging than the first. It is almost as daring as bungee jumping and ends on a cool note of a zip slide at all levels. These activities are suitable for company staff retreats or group of friends. When counting them they seem few but they are so draining, you wouldn’t go for a second round even if you didn’t have to pay. You can take children as well if aged eight and above. After this sleeping, card and board games is all you will be able to do. A friend and I decided to play Twister to help stretch our muscles, that didn’t go to well. The nights at island are quite and peaceful. At adventure park, power is switched on at 7pm to 10pm. It can be kept on longer at a fee. It is then that you can take a hot bath and charge electronics. When the water levels are low, they hold a camp fire at the beach – it is beautiful. A friend carried a portable hoofer with which we played music off our phones, it spiced up our visits so much as we turned the dormitory in which we were sleeping into a mini dance hall. It was fun. When we attempted to move around, we ended up at Lagoon Resort whose staff unlike those at Lake Side Adventure Park where not as friendly. Seeing as there was a swimming pool unlike at the park, we decided to go swim there But even though the pool was abandoned, we were refused from using it because when they have guests it is exclusive to them. As we turned to live, we were asked to pay Shs5,000 for entering the resort. It is something clearly written on a sign post at the entrance. But we thought we wouldn’t have to pay it since we wanted to swim. It costs about Shs500,000 per night ($200). We hurried back to the friendly (need I add affordable) Lake Side Adventure Park but not before walking down to the Lagon Resort beach. The walk way is heavenly, a day there can heal you of all the stress. These also have a speed boat. We were totally impressed by Lake Side Adventure Park. The staff is friendly and highly professional – they see to it that you get what they promised. Requiring you to place your orders days before your trip, the meals are delivered just on time in the most appetizing of ways. Breakfast costs Shs10,000, lunch and dinner is Shs15,000 and Shs20,000 for a barbeque. Soft drinks cost Shs2000. You are allowed to carry wine/champagne and anything else that you need but is not sold at the Island. Check out their website www.lakeside.ug to get contacts and ask to be served by a gentleman called Perfect. He is almost perfect. I grew up with my mother in a slum. Then, it was only my mother and I and we slept in a one roomed house that was divided into a sitting room and a bedroom by a curtain. That is the way everyone’s house in the neighbourhood was structured. We shared the latrines and bathrooms which sometimes would get so messed up and impossible to use. We used to have some kind of cleaning roster but some people would not clean when their turn came. On those days one couldn’t use either the bathroom or latrine. The situation worsened when it rained as some people would enter with dirty shoes and not clean after themselves. Thankfully, our houses didn’t flood when it rained especially at night, like in other places. We liked playing in the rain even if the water was dirty and before you frown, it was actually fun. For us, fun was all that we cared about. the dirty bit was for the adults to worry about. I can’t even imagine where that water came from, but somehow we never fell sick. I remember that the place used to be littered and there were filthy trenches next to our muzigo. We had a rubbish point that garbage collectors always forgot to clear and some neighbours refused to contribute money to pay the person who was supposed clean the trenches. Then, we had to wait till everyone gave the landlord their contribution. There is no privacy is slums as just by observing, everyone knew what was going on in the neighbour’s house. You would know who spent the night at whose place, what food they eat since we cooked from outside the house and what time one got back home. Most of the children around the place used to wear dirty, torn or stained clothes. My mother bought me a couple of slippers which I only wore after bathing in the evening. It was okay to run around without slippers and no one ridiculed or bothered you about it. It was so much fun to run around the neighbourhood with other children as we chased after tyres or played hide and seek. We rolled in the grass and wailed in delight as we played with each other. My mother never had to buy me toys. Life in the slum was never dull, there were fun activities to do and that did not include watching television. My mother had a small black and white one but we only watched it at night when outdoor activities were not an option. But it is not because the people in our neighbourhood were criminals or dangerous like most people think of slums. They were average normal families who just couldn’t afford to live in a better place. While there, most of us the children went to the same day school so parents took turns to take and pick us from school. Those times it felt like one big family. Most of the people were friendly and looked out for each other’s children. For example my friend’s mother wouldn’t see me cutting my slipper and pass by without scolding me. Our house was next to a market that was so vibrant in the evening. For a treat, my mother would take me and buy all sorts of deep friend snacks and oh boy was it fun. I looked forward to those days. The market would be a little dusty because of a lot of movement and we would keep stopping so my mother would exchange pleasantries with people she knew. It is only when we went to church and found children with better clothes and white shoes that I envied children who lived elsewhere. But that was momentarily. The slum was home and I loved it, I didn’t wish to be anywhere else. Later, this was taken away from me by a man that I later learnt is my father. My father’s home was enclosed in a gate. It was a lot bigger than my mother’s place with a living room, dining room, a telephone, big fridge and I had my own bedroom. There was a video player and DSTV so we were glued on the TV most of the time. It looked like it was from the movies. I found it so cool and exciting but after a few weeks I got bored and missed being under the sun and running about in the open. My father had two cars, one to take us around and another that he used. My half sisters and brothers had never used a taxi before so they did not know many places which I found so bizarre. I remember laughing at them and I bragged that I was "sharper" than them. I later got used to my new life and within no time I could fit in both worlds just fine. And since the posh places are, according to society better than slums, before long my mother was out of the slum and I spent more time at my father’s. Unlike what a number of people think, I don’t believe that people in the slum have a lesser life compared to those who live elsewhere. They lead a normal life. Despite the neighbourhood and surrounding, the slum is home and it always feels good to be there though they wouldn’t mind having better. I dislike boda boda riders probably as much as you. But I am the worse person for helping more get on the streets and I make money from them. It is not a fortune but it is something. “I have been working for about four years now. This is an idea I came up with when I had been working for three years. Though I was paid at the end of the month, I earned wages, so I did not earn a stable amount, which made planning for it hard. But even then, I knew the range. Regardless of that, when you have an accountant father, saving money is inevitable especially if you have a job. It does not matter that you do not know how much money you will have at the end of the month. So, I started saving after my second month at work - July 2009. I earned Shs250,000 in the first month so I decided to save Shs100,000. That left me with little money, but my parents were still paying my hostel fees, tuition and also gave me pocket money. I only needed money to transport me to work from the university and back - what I remained with was more than enough. I continued saving Shs100,000 every month for a year. And by the way, that should not make you think I’m a disciplined person financially. I’m not. I’m an impulsive buyer who even takes shoes and belts on credit. I know my weakness so I placed a standing order for the bank to always deduct the money as soon as it gets to my account and place it on another account. When it is not on my main account, I cannot use it. After a year, I had saved Shs1.2m. By then I was working so hard and earning about Shs500,000 a month. So I started saving Shs200,000. I did that for a year and by the end of it I had saved Shs.2.4m. The sum on my account was Shs3.6m. Two years later, I graduated and my parents stopped helping me financially. I moved back home so I did not have to spend on rent and bills. But the rest of the things like lunch, transport, air time, clothes as well as leisurely expenses are on me. Since my expenditure increased, reducing my savings was inevitable. In July 2011, I reduced my saving to Shs150,000 monthly. It left with about Shs300,000 to spend. It was not enough so I had to live on a tight budget. I continuously battled with the urge to reduce my saving. But my accountant father always calls to ask if I’m saving religiously and even asks how much I’m saving. I do not lie to him so I maintained the amount I was saving. By July 2012, I had Shs4.2m on my account. I then decided to go back to school and attain a Masters Degree. Thankfully, my parents agreed to pay Shs2m of the Shs3.8m I need for tuition annually. So I have to come up with Shs1.8m yearly. Shs900,000 was to be paid in four months. I had no other money on me so I withdrew Shs600,000 from my savings and topped up. I remained with Shs3.6m on my account. Since I had to spend on tuition, I knew it was time to make my savings multiply. I searched far and wide for a business idea and failed. Everything that I came up with or was suggested to me needed too much attention from me, which, with work and school, I knew I would not have. Besides, everyone thought depending on an employee to take care of such attention-requiring ventures was a bad idea. I needed something where all I had to do was invest the money. Then one day, as a boda boda rider was taking me home, he started whining about failing to raise enough money to give his boss. He said he was riding it on a loan basis but had not paid for three months because of personal problems and now the initial owner wanted to take it. And that there, was my eureka moment. I remembered that earlier, a boda boda man had asked my mother to buy him a motorcycle to ride on a loan basis but she was hesitant. I told my mother that I was interested and she helped me do a background check on him. He had been running a number of errands for us in the past and he seemed trustworthy. He knows me and does not take me serious so I asked a friend of my mine to act like he is the one interested in buying him the motorcycle. When it was bought, my friend wrote an agreement, signed and lectured him about payment and all. So, as far as the boda boda rider is concerned, though my mother receives the weekly pay, my male friend is his boss. Sometimes he calls him to report me for taking too long to give him the book where he signs to indicate that he has paid. We agreed that he will be paying me Shs70,000 a week for 20 months and there after he becomes the owner of the motor cycle. The fuel and maintance costs are his responsibility. So, in total, I get Shs5.6m at the end of the 20 months. Since I bought it at Shs2.8m, it means every month for 20 months I get Shs140,000. He is still paying and will continue till about April next year, after which it will be his motorcycle. Thankfully, he has so far made his payments religiously. Of course, it is little money but since I do not break a sweat to get it, it is okay. My plan is to buy as many as I can so I can earn more. There are so many young boys that want to join the boda boda business but cannot afford to buy the motorcycles and would therefore be happy to get an investor. However, not all of them are trustworthy. A few months ago, I was able to identify a second boda boda rider that has also started work with a second motorcycle. Since I bought this one around the time when motor cycle number plates were not available, it cost me Shs300,000 more than I bought the first one. If all goes well, profit from this will be Shs2.5m.